Rice4Kids 2013, forever in our hearts! After the first very memorable experience we lived in 2011, we collected other wonderful memories with the children of the School! 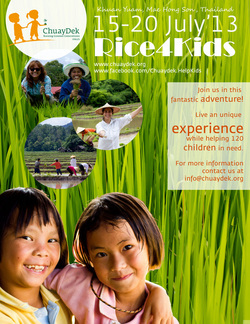 Visit the Rice4Kids 2013: the Photostory and let us know your favorite image! You will help us selecting pictures for future publications! Rice4Kids 2013 was - citing the comments of Friends who participated in it - quite a unique experience, which all of us will bring in our heart for our entire life. "We are sad to leave but we know that in some way we won't be apart. We have entered this sacred space and will bring home this experience to share it with as many people we can, to make this circle become wider and allow others to enter, realising this experience has changed us forever"